Contemporary Childrens Bedding - Beautifully designed bedding that makes little imaginations soar. Finely crafted from 100% cotton fabric for durability and ease of care. Skillfully finished using complementary prints and patterns, elaborate embroidery, and unique appliquis. Add some texture and interest to your couch with this Pillow. This cozy denim pillow features moss stitch designs shapes details. Pillow is square in shape. 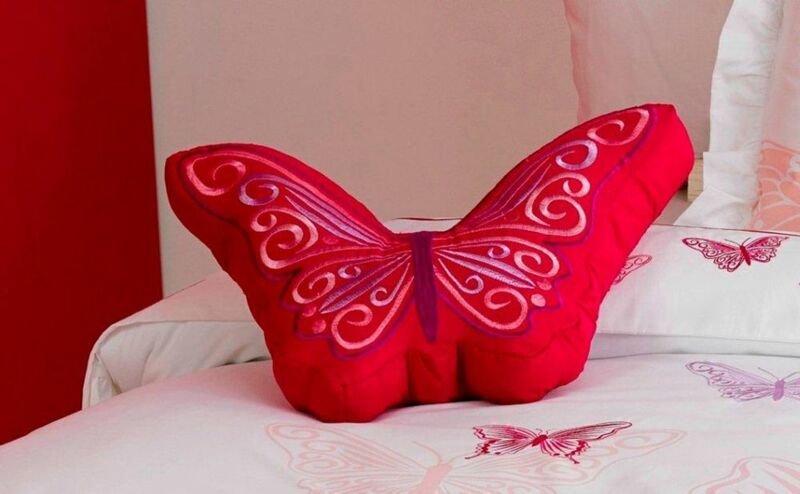 Fly Butterfly Shaped Cushion Contemporary Childrens Bedding - Beautifully designed bedding that makes little imaginations soar. Finely crafted from 100% cotton fabric for durability and ease of care. Skillfully finished using complementary prints and patterns, elaborate embroidery, and unique appliquis.